The design of the Sydney metro was unveiled on Nov. 6 by New South Wales Minister for Transport, the Hon. Andrew Constance after the delivery of a life-size model by Alstom. The company is contracted to supply 22 Metropolis trainsets and the signalling system2 for the Sydney Metro Northwest project1 awarded by Transport for New South Wales (TfNSW) to the Northwest Rapid Transit consortium. The Sydney Metro, the first fully-automated metro network in Australia, is slated to enter into commercial service in the first half of 2019. 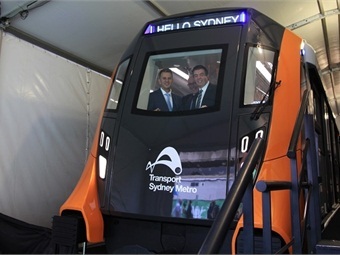 The interior and exterior design of the Metropolis railcar for Sydney was designed in close collaboration with TfNSW in order to enhance passenger experience and provide a unique identity for Sydney, according to Alstom. The metro features three double doors per car, enabling passengers to rapidly get on and off the train. It includes a distinctive nose design allows commuters to travel while looking directly out the front of the fully-automated train. The shape of the nose, as well as the colour of the livery, will be designed with input from the community3. The interior layout of the Metropolis railcar for Sydney features areas for strollers, luggage, bicycles, wheelchair spaces and separate priority seating for those with reduced mobility. Once inside the train, passengers will be able to circulate freely. The life-size model will be submitted to tests over coming weeks to a cross section of the community including school groups, parents with prams, people with reduced mobility and the elderly. Emergency services and engineers will also test the model. The Sydney metro will be equipped with the Alstom CBTC4 signalling solution Urbalis, allowing trains every four minutes in peak time. For safe and faster on-boarding, the network will also feature platform screen doors. The train, manufactured by Alstom, is customised for Sydney and based on the internationally proven Metropolis train. The Metropolis trains currently operate in more than 25 cities around the world including Singapore, Barcelona and Amsterdam.